Stargirl has moved away from Arizona to Pennsylvania. It is a lonely place. She's back to being homeschooled and misses the folks back in the desert. In her loneliness, she starts a letter to Leo that fills the entire book. In this letter she describes her new friends (talkative six-year-old Dootsie, agoraphobic Betty Lou, feisty Alvina, distant delinquent Perry, and others) and her attempts to keep her wagon full of pebbles. The writing maintains its sweet melancholy, but as the narrator's perspective shifts from Leo to Stargirl, the appeal of the story fades. In Stargirl, there was a worshipful distance between us and Stargirl, a sense of mystery, and a sadness of the narrator realizing that he never really appreciated her. Stargirl may have been put on a pedestal, but it was a beautiful view. Switching the story to Stargirl's perspective in this second book cuts away at that mystery. Instead, Spinelli relies upon quirky outside characters to enliven the story. Stargirl loses much of her quirks as she loses her mystery. 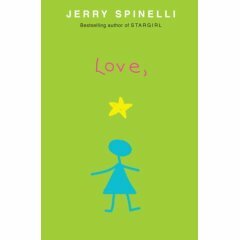 In the end, she becomes more than Opal in Because of Winn-Dixie (an excellent book to be compared with, I might note), but she isn't really Stargirl anymore. And even she knows it.